I recall the unexpected joy I felt when I first sat down to watch Sisters and saw that it seemed to star (or at least co-star) a black man. And not your typical 1970s Hollywood black man either — struttin’, jive talkin’, ho slappin’ — but rather, an honest-to-goodness upper middle-class, suit-wearin’, proper talkin’ professional black man named Phillip (Lisle Wilson). The film opens with a series of intriguing and subversive racial situations, as Phillip finds himself on a hidden camera TV show in which a supposedly blind white woman begins to take her clothes off in front of him, unaware that he’s there. He manages to (barely) avoid the lusty black man stereotype — although it might’ve been nice if he’d warned her that everyone can see her junk. The show, by the way, is called Peeping Toms. I’m not sure if the racial innuendo of the title is intentional, but seeing as how the movie is aware enough to joke about Phillip getting the parting gift of dinner for two at a restaurant called “The African Room,” that may indeed be the case. The lady in the skit, incidentally, turns out to be Danielle (Margot Kidder), a model who invites herself along for Phillip’s dinner. One thing leads to another, and badda bing, they’re back at her place. Furthermore, Phillip’s death brings to light the issue of interracial relationships in film, still something of a taboo today. There aren’t many documented instances, but history has shown that black-white miscegenation in horror movies is not a good idea. From mainstream fare like House of Wax, Candyman, The Omega Man and Frogs to lesser-knowns like Ritual, Necronomicon: Book of the Dead, Tanya’s Island, Cut Up and Soul Vengeance, things rarely turn out well for those involved. Sure, the Invisi-Wall costs a lot, but it pays for itself in the long run. 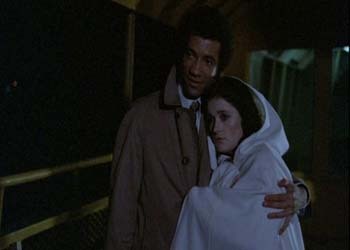 Leia and Lando: down with the swirl. Drive-by vasectomies have hit an all-time high.